Fes desert tour: A 4-day trip from Fes to Marrakech via Sahara desert, Todra gorges, and Ait Benhaddou ksar. During this tour, you will experience camel riding, and spend the night under the stars in the desert as well as explore southern Morocco. Combining the two imperial cities of Marrakech and Fes with the Sahara desert will make your trip as rich as it can be. – Pass through Ifrane, a winter ski resort built by the French in the 1930s to resemble a Swiss village. – Visit the Cedar forest in Azrou and see the monkeys in the trees of the Middle Atlas Mountains. – Drive along Ziz Valley. 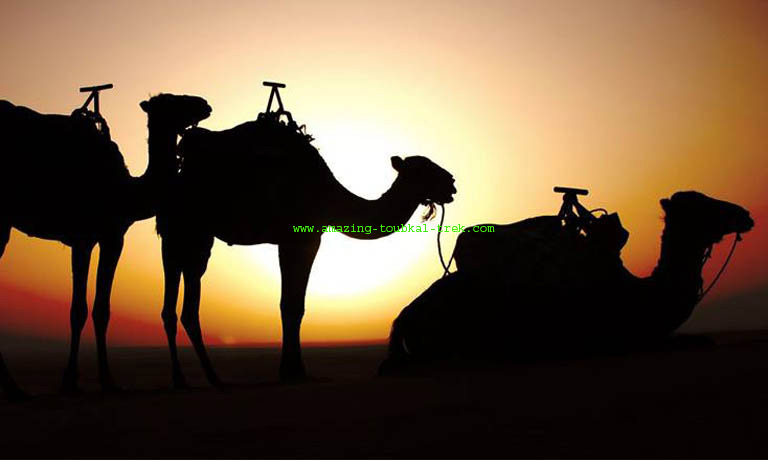 – Enjoy camel ride tour, sunset and sunrise in Erg Chebbi dunes. – Spend the night in desert camps with Berber drums music under a starry sky in the middle of the Sahara desert. – Walk in Tinghir oasis and visit the Gorges. – Drive along the road of 1000 Kasbahs, Roses Valley, and Skoura oasis. – Visit Ouarzazate Kasbah Taourirt and the film studios. – Visit the UNESCO world heritage site, Ait Benhaddou Kasbahs. We will leave Fez early in the morning, en route to Merzouga. Along the way, you will see many attractions like Ifrane, the Swiss-themed ski resort. From there we will pass through the forests in Azrou where you can see the native monkeys. A majority of the drive is spent traversing through forests, natural springs, rock-walls, and small villages. Halfway down to the Sahara Desert we will make a stop in Midelt for lunchtime, and marvel at its history in fossils and rocks. The last leg of the journey to Merzouga will include a stop at the scenic spot that boasts panoramic views of the area below. In the afternoon we will arrive in Merzouga and celebrate with food and music, and turn in for the night in a traditional Kasbah. After resting and having breakfast, the adventure will continue by taking a 4×4 vehicle through the desert for nearly half the day. Along the way, we will encounter the different appearances of dunes, pass through tiny villages, and potentially stop and have a drink with a local Berber family. After that, we will make our way towards a cave, where you will get a lesson on how native people obtain fossils from the earth. We will refuel for lunch with a Berber family again, then prepare to head out via camel. The camel trek will give you an even better idea for what the desert landscape is like, and after about 2 hours of riding we will rest at a camp and spend the night in a Berber tent. The evening will be filled with traditional mint tea, food, and Moroccan music. In the early morning, you will have a chance to make a short trip to the dunes and watch the sunrise, where the sun rises from just beyond the Algerian borderline. We will travel by camel once again, back to the hotel where you will have a chance to shower and eat some breakfast. After that, it’s time to head out towards Rissani and the Gorges (Todra and Dades). Along the way, in Rissani we will encounter monuments and areas of interest that have to do with the Alaouite dynasty. 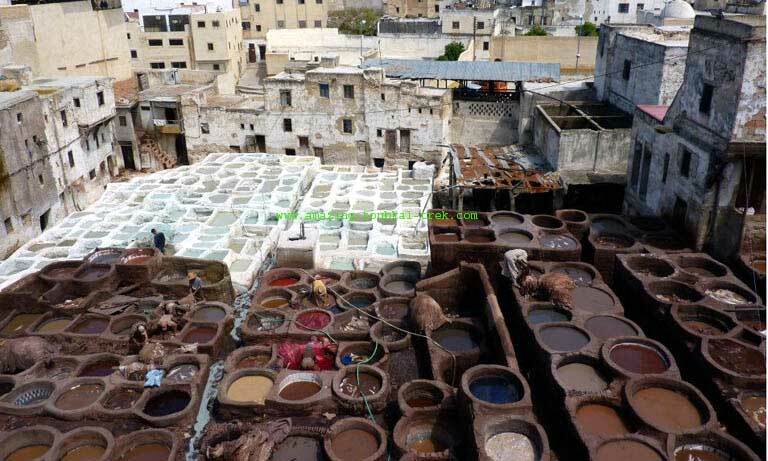 The city of Rissani is also home to over 350 Kasbahs, as well as many museums and market areas. After Rissani is the Gorges, which we will walk through and take in the beauty of the mountains and rivers. Once we arrive in Dades Gorge, we will enjoy a traditional meal and rest overnight in a Kasbah. After finishing breakfast and touring the gorges, we will stop in at the town of Ouarzazate, home of the Kasbah of Taourirt and the Atlas Studios. After that it’s time to head to Ait Benhaddou, then travel the Tizi-n-Tichka road on the way to Marrakech. Along the way, we will pause at a village lunch. In the late afternoon, we will finally arrive in Marrakech. End of Fes desert tour. – This Fes desert tour is available and can be arranged for groups of all sizes. 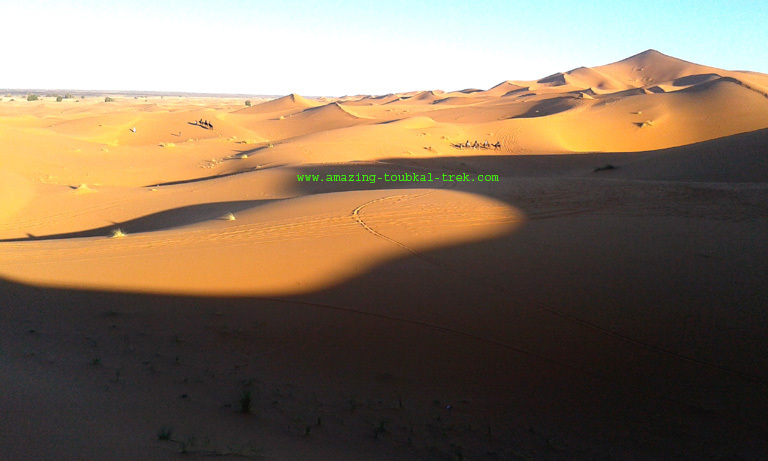 Fes desert tour to explore the high dunes of Erg Chebbi and to ride camels. Fes Desert tour, Trip from Fes to Marrakech via Sahara Desert.